If you don't see your model number, don't give up! Not all model numbers are in our database. Please view all parts currently available for BRINKMANN, listed below by part type. Still no luck? Contact us - we're here to help! Find Exact Brinkmann Repair Parts. Begin with your Brinkmann Grill Model Number. Most Brinkmann grills have a series number and type on the front of the grill. For example, "Pro Series 2400." While series information is different from model information, Brinkmann Corporation uses a simple method of series and model relationship. If your series number is "2400," add an "810" to the beginning of your series number to create the model number "810-2400." If there's not a series number on the front of your grill, try looking on your original owner's manual. The model number should be on the front page and will usually be listed on the bottom of each page. Even if you don't have your manual, that's fine too! Look for a small metal plate or label with certification information on it, including your model number. These plates are usually on the back of each grill. Look for a number that starts with 8; like 810, 820, etc. The most common models for Brinkmann start with those numbers. 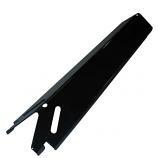 Still no luck finding your Brinkmann gas grill parts model number? Call us! We want to help you keep your grill in your backyard and out of a landfill. We can use measurements of your original Brinkmann burners, cooking grids, heat shields and other Brinkmann gas grill parts to find replacements for your grill. Just remember to remove the parts from your grill before measuring them to ensure you get the most accurate dimensions. Click the drop-down menu at the top of this page to get started if you have a model number. If you know the dimensions, use the filters to choose the type of part you need (burners, cooking grids, heat plates, burner brackets, ignitors, or other). If you would prefer a live customer service representative, please give us a call at 877-244-0737. Brinkmann Heat Plate, Porcelain-Coated Steel | 14-7/8" x 3-1/8"
Brinkmann Straight Pipe Burner | 17-13/16" x 1"
Brinkmann Carry-Over Tube | 7-5/16" x 2-1/8"
Brinkmann Heat Plate | 16-5/16" x 2-3/8"
Brinkmann Burner, Stainless Steel | 14"
Brinkmann Value Tube Burner, Stainless Steel | 15-3/8"
Brinkmann Carry-Over Tube, Stainless Steel | 7-3/8" x 2-3/8"